For as long as I can remember, the Irishman and I have planned to drive across Canada. We spent today, Qingming holiday Monday, plotting out our first draft. 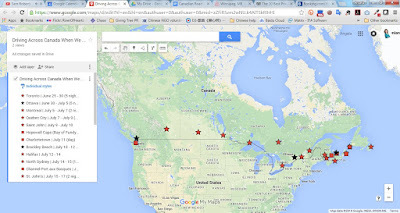 Despite brutal Chinese internet, we managed to get it all down on Google Maps, schedule and all. A YouTube Canadian music playlist even worked about 50% of the time. So, yes, it's just the bottom bits. No Northern Lights for us this time. We have a lot to cram into 6 weeks. Our longest driving day should be <10 hours and there are a lot of charming Airbnb options along the way. The Irishman came up with a general schedule about a month ago and we went over it again today, checking lodging options, tourism stuff to do and ferry schedules. It looks very doable and hopefully not too rushed. Toronto, Ottawa, and Vancouver, you'll all be sick of us by the time we roll out. It's almost time to book flights! And start rereading Anne of Green Gables! And figure out what people do to rideshare these days --I assume Craigslist has become super passé since I last lived in Canada? Help! I have managed to block out most of my fear since the Toronto to Ottawa rideshare who got very drunk, had a meltdown, forgot her diabetes medicine in the car causing us to have to drive to Kemptville from Ottawa late at night, and groped me repeatedly through our drive. Is there an app where you can rate people for being absolute nightmares and prevent others from facing the same fate? Comment please!